Jeff Zwirek’s Burning Building Comix, reviewed. The most inventively-made comic of the year is set on all 10 floors of a burning building. 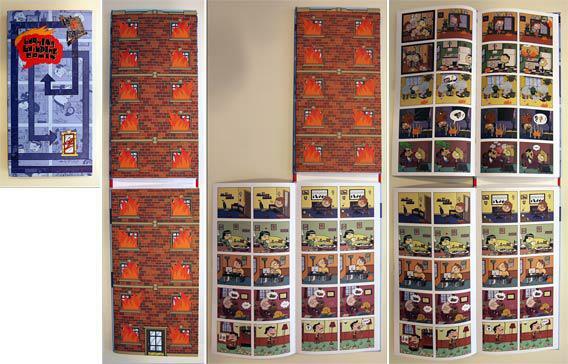 Several looks at Jeff Zwirek’s Burning Building Comix. Every month dozens of new comics and graphic novels come out, and a lot of them are really good. But they all mostly look and feel the same: They might be tasteful or tasteless or serious or funny, but they’re all characters saying words in panels between covers. That’s one reason that Jeff Zwirek’s new book Burning Building Comix is so refreshing: It doesn’t look like anything else in the store, because Zwirek’s having fun with the format of a graphic novel even as he tells a familiar story. As seen above, the book opens into a representation of a 10-story apartment building; readers start on the ground floor and then read their way up the building even as the building itself burns down. Of course, this would just seem gimmicky if Zwirek’s art and storytelling weren’t up to snuff. Luckily, his wordless panels are charmingly drawn, and his storytelling is intricate and fast-paced. The hidden relationships between the characters in each apartment—and in different apartments—are gradually revealed, as the fire unveils secrets that many of the residents would rather hide. It’s an incredibly fun book to look at and to read, and we’re very pleased that Jeff Zwirek is illustrating the July issue of the Slate Book Review. Burning Building Comix by Jeff Zwirek. Self-published; distributed by Top Shelf.